An associate professor in the Agriculture and Veterinary Technology Department, Mel joined the Alfred State faculty in 1999, after having taught at SUNY Delhi and Michigan State University. 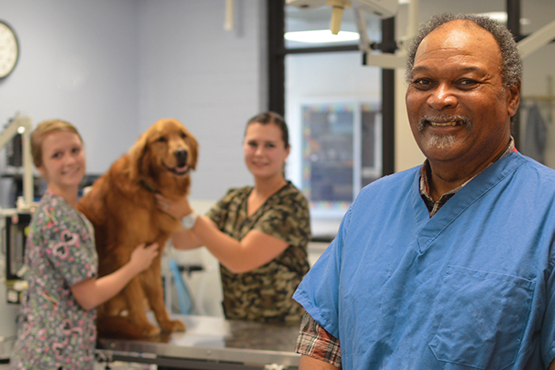 He had served his residency in veterinary pathology at Cornell University, and earned his Doctor of Veterinary Medicine and Bachelor of Science in animal science degrees from Tuskegee University. At the beginning of his Alfred State career, Mel was initially tasked with assisting the Agriculture and Horticulture Department (now the Agriculture and Veterinary Technology Department) in the development of a new veterinary technology major. The two-year program welcomed its initial class of students in the fall of 1999. After receiving accreditation in the early 2000s, the program, under Mel’s leadership, soon formed valuable partnerships with the SPCA Serving Allegany County, and later with the Hornell Area Humane Society. Both of these organizations have provided animals for the hands-on education of students, who learn about animal husbandry, assist in the spaying and neutering of animals, monitor the anesthesia of patients, perform diagnostic blood work, and more. In addition to the students, Mel has also made quite an impact on the community himself. From 2008 to 2014, he served as the director of shelter veterinarian care at the Hornell Area Humane Society, responding to on-call emergencies, providing suggestions on disease control, and leading free rabies clinics, in which an average 150 animals were vaccinated over a two-hour period. For his work with the Humane Society, the organization’s Board of Directors in 2007 presented Mel with the Dr. Ted Beyer Award, on the basis of his commitment to helping animal shelters and the animals served by the Humane Society. Additionally, Mel has also provided vaccination and triage treatment for the Southern Tier chapter of Guiding Eyes for the Blind, which provides guide dogs to people with vision loss. Mel and his wife, Kathi, are the parents of four children: Mekalea, Kameron, Kalem, and Makenzie. Kalem is currently employed at Alfred State in the Print and Mail Services Office. As the founder of the veterinary technology major, Mel has taught every course in the program (except for clinical techniques), with topics ranging from anatomy to physiology to surgical nursing and more. In addition to leading the program from the beginning, Mel has also led its department, serving as chair from 2002 to 2004. In recognition of his efforts both inside and outside of the classroom, the college honored Mel with the Pioneer Award in 2012. For Mel, the most rewarding part about being an educator at Alfred State has been the impact he has had on students.